Gladding-Hearn Shipbuilding, Duclos Corporation, has delivered a retrofitted pilot boat to the Delaware Bay pilots association. 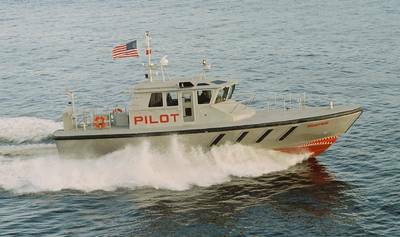 Brandywine, one of the shipyard’s early 53’ Chesapeake class launches built in 2004, is one of nine pilot boats built for the pilots since they took delivery of their first boat from the Mass. shipyard in 1957. Along with installing new shafts and Brunton propellers, the yard replaced the twin Daewoo 650 Bhp diesel engines with a pair of Volvo D16 EPA Tier-3-compliant 650 Bhp diesel engines, each delivering the same output at 1800 rpm as the original engines with a top speed of 25 knots. The new engines are connected to ZF 500-1A gear boxes. The yard also converted the engine cooling system from seawater cooling to keel cooling, using Fernstrum grid coolers. A Humphree interceptor trim control system, with automatic trim control, was installed at the transom. Along with new windows and doors, a diesel-fired boiler was added to improve the deck, handrail and cabin heating system. The hull’s worn fendering system was replaced with Duramax replacement rubber, along with additional diagonal strakes aft.